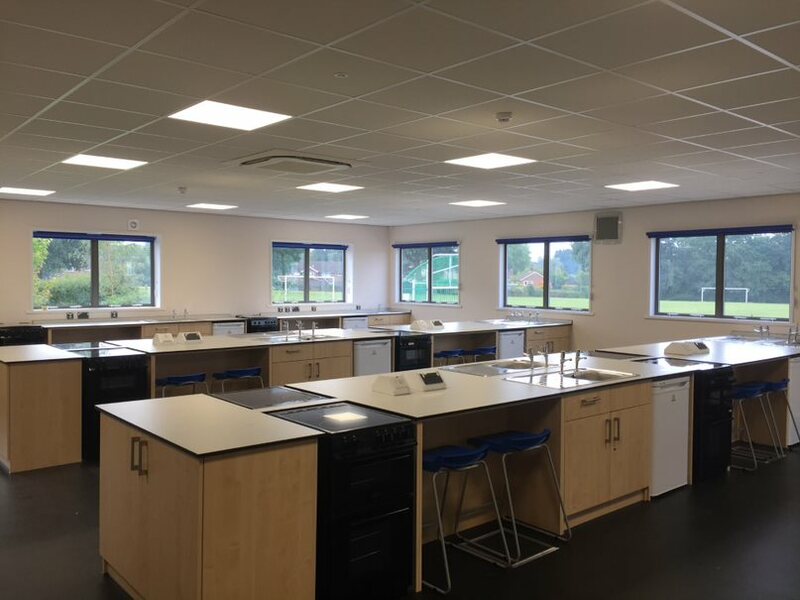 We worked with West Sussex County council to create 2 new classrooms which will provide teaching facilities for 64 children for Food Technology and Science classes. The works included new gas, water and electric mains feeds, footings new block work piers and retaining walls for the 7 Modular buildings to be placed upon. The science lab was constructed with suspended ceilings and a teachers work station. We also installed 6 new pupil work pods, with the facility to install a mobile fume cupboard. The food technology classroom has been built with a main teaching station with 16 new cooking stations. Externally we have installed new pathways, new foul and storm water drainage. The surrounding area has also been re-landscaped so that it blends into the existing building. During the project we also added a modular extension to the existing dining hall. This comprised of 4 modular units, removal of existing brick work, windows and a new mains electric supply. Works also included adding a new protective covered area and re-positioned an existing snack shack within the covered area and re tarmacked to new falls to drainage.